I feel like I could maybe get a little tipsy on this dish. The bourbon shines through and the whole saucy stickiness of the dish just makes me go “oooh”. When Bourbon Chicken comes out of the oven it feels like the flavour train just came to pick me up. Once upon a time getting sloshed on bourbon was not unusual, but now, I just like it with my chicken (and pork ribs). Lately I’ve been slammed by work and I don’t see it slowing down at all. Comfort food sometimes (alright often) beckons during such times. Thankfully this recipe is super fast and easy to make; no-stress, no fuss. It is sweet enough that any daily cravings for chocolate subside. The chicken thighs are very tender when floured first. But the flouring process is certainly optional. There is so much bourbon sauce left in the oven dish, it can be spooned over the chicken on a serving plate and eaten with the vegetables. Serving the bourbon chicken with a stack of steamed vegetables (especially broccoli) works well. 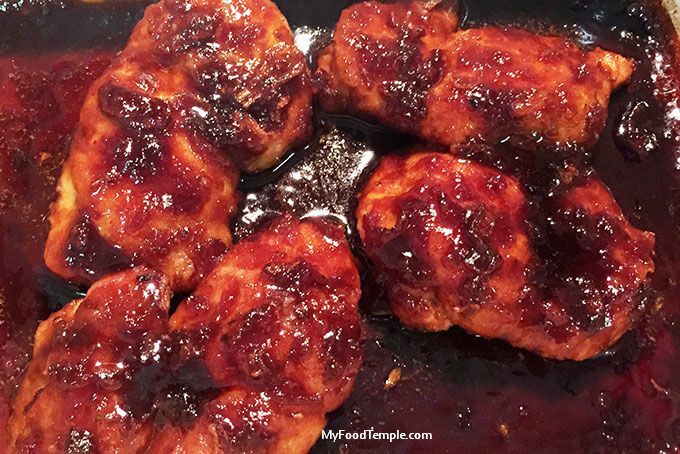 The recipe makes a good amount of bourbon sauce, so to serve four, just double the amount of chicken thigh fillets. Pour mixture over chicken (spoon extra sauce over top of chicken -bottom part of chicken should be sitting in sauce). Bake in the preheated oven, for 25 - 30 minutes until chicken juices run clear and chicken is cooked. Small thigh fillets that were well browned can even take as little as 20 minutes and really large ones as long as 35 minutes. Once cooked, place on serving plate and spoon over the sticky bourbon sauce.